Carrie Haddad Gallery presents “Earth Sky Dream”, a group exhibit featuring artists Linda Newman Boughton, Chris Freeman, Laura Von Rosk, Bruce Murphy, Vince Vella and Jane Bloogdood-Abrams. The exhibit will be on view June 3rd through July 12th. A reception for the artists will be held on Saturday, June 6th from 6-8 pm. All are welcome to attend. With great pleasure, Carrie Haddad Gallery introduces Linda Newman Boughton in her first exhibition in Hudson, NY. One who mistakes a ball-point pen for the medium of a doodling high-school student would instantly be proven otherwise by Boughton's awe-inspiring drawings on Arches paper. 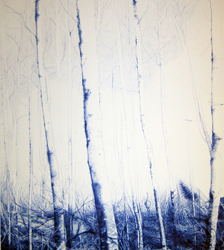 Inspired by Baroque landscapes and her love of nature, recent drawings are composed entirely of blue “Rite in The Rain” ball-point pens. The result is a work of art so intricate that it takes the ink of at least four pens to produce. The drawings could almost be mistaken for lithographs but under close inspection one gets lost in the perfect placement of permanent blue ink, only made possible by the mastery of the artist's hand. Boughton's love for drawing flourished in a fashion illustration class at the Florida State University. She later studied at F.I.T in New York City where she worked in the fashion industry for several years illustrating, designing accessories, and shooting freelance photography. The fashion world led her to Hollywood where she became lead scenic painting sets, murals and assorted artwork for feature films and television series such as Fight Club, Water for Elephants, & The Desperate Housewives, among many others. Boughton has exhibited both drawing and painting at The Long Beach Museum, several group shows in Los Angeles, and at Davenport and Shapiro Fine Art Gallery in East Hampton, NY. Several of her paintings and drawings are also included in Stewart and Lynda Resnick’s personal art collection. Chris Freeman's approach to his recent body of work is quite the opposite of the slick, gloss polyurethane and oil paintings produced during his time spent in New York City in the 80s and 90s. Today, he takes a highly personalized approach to his materials, using latex house paint, small brushes, and queen-size bed sheets. The surface of the bed sheets are the material embodiment of his intimate life—they fit his body, they are the space of dreams and relationships, the daily cycles of waking, breathing and thinking. When he is awake, his walks in the woods have become a space of contemplation away from the manic noises and distractions of cities. In his painting Twins, he builds a blinding array of branches that make up our view, representing the complicated ties between one another and especially with those we love. In You There? While finding himself lost in the forest, Freeman surrenders, lying down on the ground to look through the trees and ask the Universe if it does indeed exist. His work illustrates a place to grasp what his experience and memories are about, a place to contemplate the trials of life, a moment for a greater connection and inspiration. Chris Freeman made art and worked with other artists during his time in NYC. He built and installed sculpture for names like Claes Oldenberg, Vito Acconci, and Nam June Paik, but it was his relationship with Richard Artschwager that opened the world for him then. He moved to Hudson in 2005 where he restored a synagogue that now serves as his home and studio. This will be his first exhibit with Carrie Haddad Gallery. Contemporary painter Bruce Murphy presents a new series of soft-focus abstract landscapes as well as paintings on sheet metal. Murphy's materials of choice are enamel paint, metallic powders and gold leaf which he layers onto pieces of copper, paper or wood. These surfaces are later unearthed when the artist scratches into the color which he finishes with a final coat of thick automobile varnish. Recent paintings more closely resemble landscapes; harmonies of deep blue, green, and purple hues give way to distant horizons or light reflecting off water. Works on metal conjure up something much more abstract, with mood rusty colors spun with poetic notes of rose and yellow. Murphy cites Pierre Bonnard, founding member of the Post-Impressionist group Les Nabis, as a major artistic influence for his illusory use of chromatics. Bruce Murphy graduated from the Parson's School of Design with a BFA in painting. He later worked as a graphic designer for various publications such as House and Garden. He currently devotes himself full time to his art. Laura Von Rosk blurs the boundary between reality and the subconscious through mixing visions from memory with emotionally charged imagery. These visions of landscapes become “dreamscapes”, where forms are repeated, emphasized, manipulated, or invented into fantastical environments in which nature takes on bodily forms. The voluptuous contours of mountains and valleys exude the sexuality of nature’s feminine energy. Von Rosk is a unique talent, transforming small one foot panels to create an intimate experience of a vast, expansive space. The artist received her MFA from the University of Pennsylvania and her BFA from SUNY Purchase. She has received a NYFA painting fellowship and a grant from the Pollack-Krasner Foundation among other awards for her work. Von Rosk currently lives and works in the Adirondacks. Vince Vella’s landscapes are the work of a spontaneous painter obsessed with his mantra of “Rock, Sea, and Sky”. The charming shades of pale pinks and greens, maroons and gray pastels are brilliantly juxtaposed; the colors themselves assume the roles of land, sea and sky to define the horizon. Vella exhibited his work in galleries from Cape Cod to the Hudson Valley, and helped many people through his work as an art therapist. Born in Rome, NY, he studied at SUNY New Paltz and Empire State College in NY. When Vince Vella passed away in 2012 at the age of 66, his pastels were generously donated by his wife to Carrie Haddad Gallery. The proceeds from sales are donated to non-profit organizations in Columbia County. To date, the gallery has donated to Animal Kind, Columbia County Probation Offices, The Roeliff Jansen Community Library, Columbia Memorial Hospital, Salvation Army Daily Soup Kitchen, Columbia Greene Community College, and the Hudson Little League. The upstairs gallery will feature the work of painter Jane Bloodgood-Abrams, one of the area’s most celebrated landscape artists, who graces viewers with her Luminist inspired compositions of the Hudson River Valley. In her twentieth year exhibiting at Carrie Haddad Gallery, she never fails to enchant her audience with views of the Catskill Mountains and magical light reflected from the Hudson River as described by Henry Hudson, Thomas Cole and Frederic Church. Bloodgood-Abrams translates her experience with nature onto canvas, working and reworking over a period of time with layers of paint that are applied, wiped away, and reapplied. The result is a radiantly dramatic remembrance of Bloodgood-Abram’s encounter with “something beyond everyday life”. She received her Master of Fine Arts at SUNY New Paltz and paints primarily in the Hudson River Valley and the Berkshires. Her work is exhibited internationally and regionally. Carrie Haddad Gallery is located at 622 Warren St. in Hudson, NY and we are open daily from 11-5 pm, Sundays 12-5pm. For more information and directions, please call (518) 828-1915 or send an email to carriehaddadgallery@verizon.net.